The Chrissy B Show Real Talk! Real Life! Real Entertainment! What is the MHDChallenge? The MHDChallenge stands for Mental Health Dance Challenge. 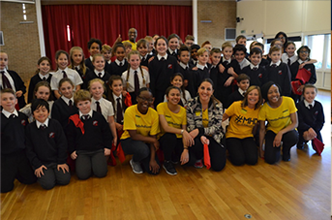 It is the world’s first ever dance challenge in support of mental health. Funky music and powerful dance moves depict the fight back against depression and other mental health issues. It creates a fun environment to talk about something serious that may otherwise remain hidden. What’s the aim of the MHDChallenge? The main aim is to encourage people not to let depression (and other mental health issues) take over their lives, prompting them to fight back. It also aims to encourage people to open up and seek help without the fear of being stigmatised, because having a mental health issue isn’t anything to be ashamed of. This brings a wider understanding of mental health to the general public by getting more people talking about it. How did this idea come about? Chrissy B (Executive Producer and Host of the Chrissy B Show) came up with the idea of the dance and then worked closely with the Victory Youth Group to put it all together. She suffered from mental health issues for several years including anxiety, depression, panic attacks, a phobia of death and OCD. She felt extremely lonely and that she couldn’t talk to anyone because they wouldn’t understand. When she finally sought help, she was taught how to beat her problems for good. Now totally recovered for over 20 years with no relapses, she wants more people to feel comfortable to open up, get help and live again. Watch Chrissy B’s interview here. How can I take part in the MHDChallenge? There are various ways you can take part but the very first step is for you to watch the official dance video and get inspired. Don’t worry if the dance looks a bit complicated at first because there is an easy-to-follow tutorial to learn all the moves. You can also download the MHDChallenge soundtrack for free. The dance has a challenging part and an easier part. Choose to do either or both parts. You can even put your own stamp on it by freestyling at the end. And remember, have lots of fun. Note: You will need something red such as a hanky or scarf to do the dance, which signifies you declaring war against depression and anything else that is trying to put you down. – Post on social media and challenge others Record yourself doing the challenge and post on social media and challenge your friends and colleagues to do the same stating the following – “I (your name) challenge you (your friend’s/colleagues names) to do the #MHDChallenge.” You can do this by yourself or as a group. (By the way, your video could be selected to air on the Chrissy B Show on mytv SKY 191). – Organise a fun day with loved-ones How about friends and family get-together (with food and refreshments) where you can all learn the MHDChallenge together. You could even have teams and have a friendly competition. Use this as an opportunity to remind each person that they are loved and that you are there for one another. With 1 in 4 people in the UK experiencing a mental health problem each year and 1 in 6 people reporting experiencing a common mental health problem (such as anxiety and depression) in any given week, it’s almost certain that someone you know is going through a hard time, even if they’ve never told you. You never know, you could end up saving someone’s life. 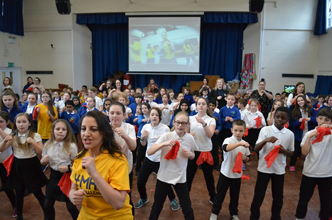 – Organise an MHDChallenge day at your school, college or University Your dance department could teach the MHDChallenge to the students and then have workshops discussing mental health and the importance of opening up about any issues. – Organise a wellbeing morning at your workplace Ignoring mental health issues in the workplace can be extremely serious not only for the individual but could also impact on the business itself. What impact has the MHDChallenge been having? 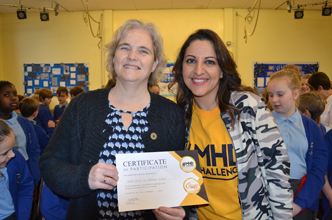 Hundreds of children and young people have already participated as part of Chrissy’s MHDChallenge Tour around primary and secondary schools, including a school for Autistic children, (see below for links). Chrissy speaks about her mental health journey and then highlights the importance of not hiding a mental health problem but to open up and get help. If you would like to buy the official T-shirt, click here. 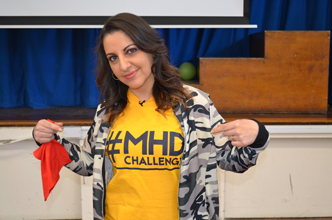 To book the MHDChallenge team and hear Chrissy speak, email info@chrissybshow.tv.